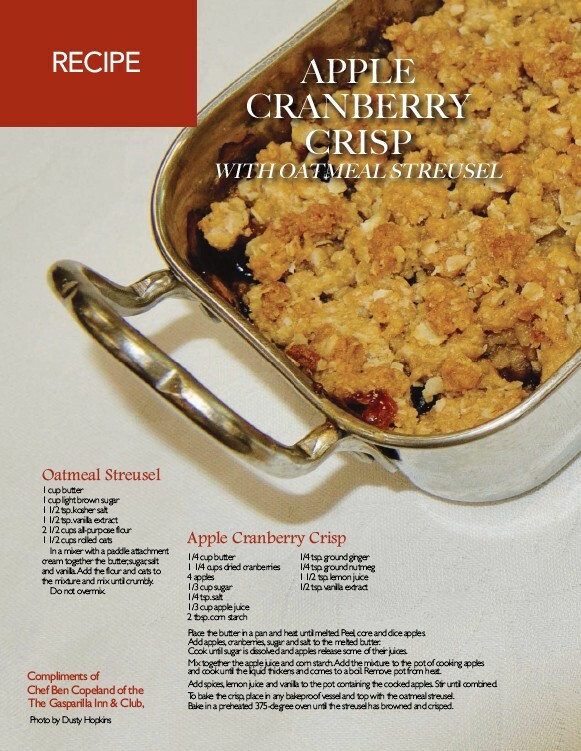 RECIPE APPLE CRANBERRY CRISP WITH OATMEAL STREUSEL Oatmeal Streusel 1 cup butter 1 cup light brown sugar 1 1/2 tsp. kosher salt 1 1/2 tsp. vanilla extract 2 1/2 cups all-purpose flour 1 1/2 cups rolled oats In a mixer with a paddle attachment cream together the butter, sugar, salt and vanilla. Add the flour and oats to the mixture and mix until crumbly. Do not overmix. Compliments of Chef Ben Copeland of the The Gasparilla Inn & Club, Apple Cranberry Crisp 1/4 cup butter 1 1/4 cups dried cranberries 4 apples 1/3 cup sugar 1/4 tsp. salt 1/3 cup apple juice 2 tbsp. corn starch 1/4 tsp. ground ginger 1/4 tsp. ground nutmeg 1 1/2 tsp. lemon juice 1/2 tsp. vanilla extract Photo by Dusty Hopkins Place the butter in a pan and heat until melted. Peel, core and dice apples. Add apples, cranberries, sugar and salt to the melted butter. Cook until sugar is dissolved and apples release some of their juices. Mix together the apple juice and cor n starch. Add the mixture to the pot of cooking apples and cook until the liquid thickens and comes to a boil. Remove pot from heat. Add spices, lemon juice and vanilla to the pot containing the cooked apples. Stir until combined. To bake the crisp, place in any bakeproof vessel and top with the oatmeal streusel. Bake in a preheated 375-degree oven until the streusel has browned and crisped.